Today the benchmark results from the new Nvidia GeForce GTX Titan video card started hitting the web, but most reviewrs that got the card to test seem to use just one monitor – 1080p, 1440p or 1600p. We even get to see dual or tripple SLI setups with GeForce GTX Titan and only a few get to test on multi-monitor surround setups in 2D mode. But can you get the maximum from a GeForce GTX Titan on a single monitor in 2D mode, seems most of the press thinks so, but what about multi-monitor and stereo 3D gaming when using the Titan? Fortunately there is at least some benchmark results that cover stereoscopic 3D gaming, you can see the short video review with benchmarks from Linus Tech Tips embedded above. Interestingly enough a dual GeForce GTX 660 Ti video card setup in SLI ($600-$700 USD) seem to outperform the GTX Titan ($999 USD) in 1080p stereo 3D mode, other reviews show that the same 660 Ti SLi setup gives better results than the Titan in 2D mode as well. This means that for 2/3 of the price of the Nvidia GeFoce Titan you can get more FPS with a 660 Ti setup, this suddenly makes the Titan not seem so powerful, or maybe just the GeForce GTX 660 Ti is just too good especially if you couple two of these. Lately everyone is talking about James Cameron’s upcoming movie called Avatar and of course the game that is supposed to come out a bit earlier than the movie. If you ask why, well the answer is very simple – stereoscopic 3D support in the game and the movie being available in 3D in 3D cinemas, so we are going to get the full S3D treatment. And we just got ourselves a Demo of Avatar the Game so if you haven’t tried it out yet, you better do so – the full game is expected to be officially available on 1st of December, so there is still some time to enjoy the demo. The good news is that the demo of the game and of course the game itself features a very wide array of stereoscopic 3D technologies supported and not just Nvidia’s 3D Vision, including even iZ3D’s drivers. So all the supported modes are as follows: Full Checkerboard, Sensio, RealD, Line Interlaced, Side by Side, nVidia 3D Vision, iZ3D and Dual head. My focus will again be on the 3D Vision, as for the moment I was able to try it only with that, but I’ll also try to test the game with other stereoscopic 3D setups I can. 1. Go to the Nvidia Control Panel, Stereoscopic 3D and enable the “Hide stereoscopic 3D effect when game starts” option (if you haven’t already). This will allow you to avoid the crash you are getting at the start when you try to run the game with 3D Vision enabled. 2. If you completely disable the 3D Vision from the control panel you won’t see the mode present in the list of S3D options inside the game menu, but the game will also start, avoiding the crash when you have it with Stereoscopic 3D mode enabled. So you need to have it enabled, but hidden when the game starts! 3. Run the game, go to the Options menu, Display and Enable 3D, choosing nVidia 3D Vision in the list if 3D formats. This will activate the 3D Vision and you don’t have to press the button on the IR emitter to activate it, although it was set to be disabled when the game starts. 4. 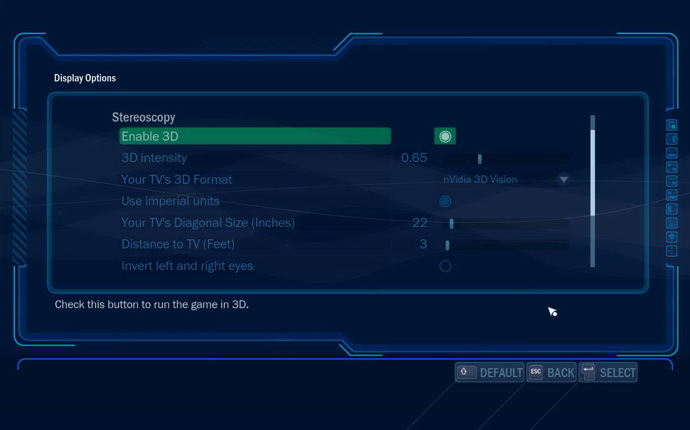 As an alternative to step 3, you can skip the activation from the in-game menu of the 3D mode and use the button on the IR emitter or CTRL + T. This basically does the same thing as activating the mode from the in-game Options, just be sure that nVidia 3D Vision option is being selected in the Options menu as a 3D format, otherwise you might happen to have two different 3D modes activated at the same time and this might lead to significant performance drop and visual problems.